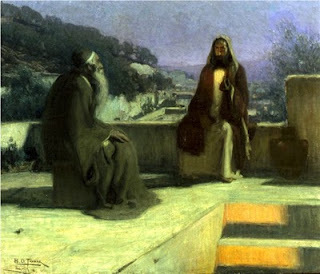 For the remaining three Sundays of Lent, here are links to earlier posts, which have been visually updated since they were first posted. He Told Me Everything I Have Ever Done! She came to the well every day at noon, when the sun was hottest. 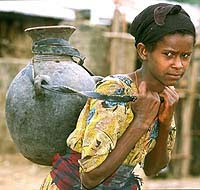 The other women in the village had long since gone back to their households, lugging the heavy water that sustained life and health in a dry land – as millions of women still do, daily, in poor and developing nations all over the world. Coming to the well at midday meant that she could avoid the dulling pain of being shunned and frozen out of the cheerful group that would meet each morning at the well, to carry the water in the cool of the day. Poor Nicodemus. It’s not just that as a leader and teacher of the nation, he seems thick and pedestrian. But at a more personal level, he comes seeking something, then seems clueless. This is the first of three long conversations in the gospel readings for this and the next two Sundays. Each is between Jesus and someone on a journey of faith. Each seems to go further in finding faith in the one before them. And poor Nicodemus has the misfortune to be the first one, the slow one. Struggling with questions can be important in helping us to faith, in strengthening and defining faith. Yet when we’re resistant or reluctant, or simply in the wrong place to see clearly, we can keep asking questions to help us avoid the real issues. A long-time presence on the New York City and New Jersey airwaves has died. Danny Stiles had a radio show like no other. Devoted to the popular music of days gone by, he would spin records of smooth crooners and hot swingers, of jazz men and women, of even some doo-woppers and rockers, of the luminous greats and those whom time had passed by. And always tenderly and lovingly for his audience, his fans, and the musicians who continued to give so much pleasure, at 78 and 33 and 45 revolutions per minute. We'll miss you, Danny boy, and will always picture you in your Art Deco penthouse studio, high atop a New York City skyscraper. WNYC article - scroll down for Danny's lovely landscape of legacy left in his legion of listeners' letters. &nbsp&nbsp&nbsp&nbsppeople tell of your wonderful deeds. &nbsp&nbsp&nbsp&nbspit is I who judge with equity. &nbsp&nbsp&nbsp&nbspit is I who hold its pillars firm." 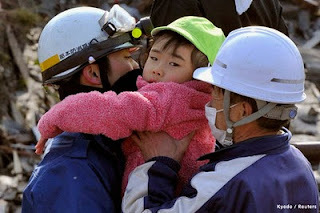 Holy One, watch over the people of Japan and all Pacific lands as they are faced with earthquake and tsunami. Lead those in danger to safety, and lead those in safety to respond with care and generosity. Receive into your heart, O God, the dead and the suffering, and hold firm the pillars of your earth and your people, that we may be assured of your support in this and every time of need. We ask in the name of Jesus, who stood among us, who was brought down to the grave, and who rose again that we might know the fullness of life in your love. Amen. Have you ever had one of those dreams where you find yourself in school, or on a busy street, or in the middle of the mall and realize you’re not wearing any clothes? Put aside for a moment the question of sin, and pay attention to the emotional experience. When they realized they were naked, they knew how exposed, how vulnerable they were. As naked as an addict who has hit bottom. Naked as a politician whose lies are no longer believed. Naked as an ordinary family whose credit has collapsed, whose home is in foreclosure. As naked as Jesus in the desert, standing before Satan. The usual line on Lent is sorrow for sin. That is most certainly true. Sin and evil is something we all confront. But when the consequence of sin lands upon us, it is perhaps not so important how we got into the mess. 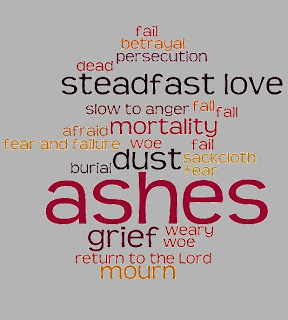 Some days, Lord, we aim at righteousness and wind up with ashes. Take the wrecked and burned and broken and wasted pieces of our lives, Lord. 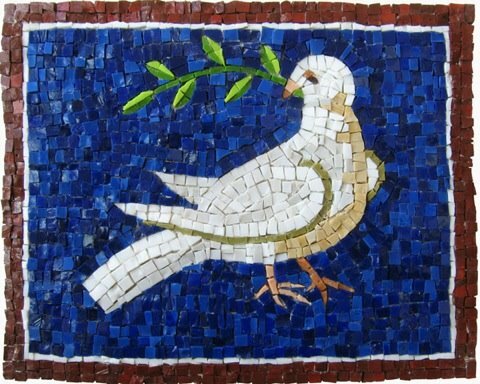 Take all the virtues that have come to naught and the crumbled debris of sin. Blow them to the winds, soak them with the rains, bleach them with your sun, that like prophet bones in the desert they may be brought together again, that life may grow where now we see only devastation. Have mercy, Lord, upon your people, and lead us in love from this day forward. Amen. Text-image by Paul Bellan-Boyer and wordle.com.